May 23, 2010 - In a continuing investigation of a fire aboard a Boeing 757 that diverted to Dulles Airport (IAD) enroute to the Los Angeles International airport (LAX) from New York’s John F. Kennedy International airport (JFK), the National Transportation Safety Board has released some information. It appears that on Sunday, May 16, 2010, about 9:17 pm (EDT) the pilots on United Airlines flight 27, a Boeing 757, N510UA, noted a strong acrid smell and observed smoke from the Captain's lower front windshield. 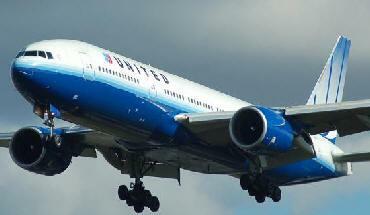 The incident occurred about 30 minutes into the flight while the aircraft was level at 36,000 feet MSL. On board the aircraft were 7 crew members and 105 passengers. The Captain and First Officer reported that they donned their oxygen masks and smoke goggles immediately after observing the smoke and fire. The Captain then gave control of the airplane to the First Officer and discharged a halon fire extinguisher. The smoke and fire dissipated but then re-ignited. The Captain obtained a second bottle from the Purser. The fire remained extinguished after this second bottle was discharged. At approximately 500 feet MSL on final approach to Runway19L at IAD, the Captain’s windshield cracked. The landing was uneventful. The airplane cleared the runway, after which ARFF (Aircraft Rescue Firefighting) entered the aircraft to check for residual heat and fire. None was found and the airplane was towed to the gate for deplaning. There were no evacuation and no injuries to the flight crew or passengers. Preliminary examination of the cockpit area revealed that the inner pane of the Captain’s windshield had cracked. One of the five terminal blocks attached to the inside of the lower left windshield was consumed by fire and the portion of the wire harness associated with this terminal block was significantly damaged by fire. There was significant sooting and paint peeling to the left hand side of the windshield air frame support. The Captain’s windshield was moved and will be examined by Board investigators at the manufacturer. Two previous windshield fire events on B757-200 aircraft prompted the NTSB to issue Safety Recommendation A-07-50. On January 25, 2004, American Airlines flight 1477, a 757-200 airplane, declared an emergency on departure from the Dallas-Fort Worth International Airport (DFW) because of smoke and fire near the windshield heat terminal. The airplane returned to DFW and landed safely. Four days earlier, on January 21, 2004, the Danish Aircraft Accident Investigation Board notified the National Transportation Safety Board of a similar incident in which an electrical fire started near the windshield heat terminal on an Air Greenland 757-200 (OY-GRL) airplane in Copenhagen, Denmark. The event occurred on the ground while the airplane was being readied for flight. The windshields from both incident airplanes were removed and shipped to the windshield manufacturer, PPG, Inc., where a teardown examination was accomplished in March 2004 under the supervision of a Safety Board investigator, with representatives from the Federal Aviation Administration (FAA), Boeing, and American Airlines. The examination revealed the cause of the fires to be the cross-threading of the screw that attached the power wire to the windshield heat terminal block, which resulted in an electrical arc and fire. Board investigators determined that the windshield from the January 25, 2004, incident was not the original one installed by Boeing; the windshield was installed in 1998. Investigators were unable to determine if any recent maintenance work on the windshield could have caused the cross-thread condition. During investigations of the January 2004 incidents, Boeing informed the Safety Board and the FAA that these events were similar to at least four other events on 747, 757, 767, and 777 airplanes and that the terminal block had been redesigned to incorporate a pin/socket connector, instead of the screw, to connect the airplane electrical system to the window heat system. Boeing incorporated the new terminal block into new production airplanes in mid-2004 and informed the Board that service bulletins (SB) for all existing 747, 757, 767, and 777 airplanes would be issued to retrofit these airplanes with the redesigned terminal block. At that time, the FAA also informed the Board that it would issue airworthiness directives (AD) that would make the SBs mandatory. A cross-thread condition is created when the screw is installed in the terminal block such that the screw’s axis and the terminal’s axis are misaligned. Because of the torque created by the misalignment, the screw cannot be fully seated in the terminal, which results in a loose electrical connection between the wire and terminal block. • On May 2, 2004, American Airlines flight 2107 from Miami to Caracas, Venezuela, a Boeing 757-200 suffered a fire near the windshield heat terminal. The window was removed and examined under Safety Board supervision, and the same cross-thread condition was determined to be the cause of the fire. • On February 23, 2006, the Safety Board received an Aviation Safety Reporting System (ASRS)2 report from the National Aeronautics and Space Administration about smoke and fire near the windshield heat terminal of a 757 from an unknown operator. • On April 23, 2006, American Airlines flight 923, a Boeing 757-200, diverted to John F. Kennedy International Airport because of smoke in the cockpit. American Airlines’ inspection of the windshield revealed a short in the windshield heat terminal block due to a cross-threaded screw. After the May 2004 incident, Boeing informed the Safety Board that it would issue the SB for 757 airplanes in September 2004. However, by January 2005, the SBs for 757 airplanes and the other models still had not been issued, and Boeing gave the Board a schedule of dates when it would issue them. SBs for all 757 and 767 airplanes were scheduled to be issued on March 10, 2005; the SB for all 747 airplanes would be issued on July 7, 2005. At that time, the FAA again informed the Board that it would issue ADs to require an inspection of the flight deck windshields to look for a cross-thread condition and to require, per the SB, installation of a new windshield with the new style terminal block. In April 2005, the FAA informed the Safety Board that it had requested changes to the Boeing SBs before their issuance; thus, the issue dates would be pushed back. SBs for all 757 and 767 airplanes were scheduled for June 16, 2005; the SB for all 747 airplanes were to be issued on September 15, 2005. A revised SB for 777-200 airplanes was also scheduled for issuance on June 15, 2005. The ASRS is a national repository for reports regarding aviation safety-related issues and events. ASRS reports are voluntarily submitted by pilots and other aviation professionals when they want to alert others about a potentially unsafe condition or event. The National Aeronautics and Space Administration manage the system, and the FAA funds it. Safety Board investigators’ repeated inquiries to the FAA since the April 2006 incident yielded no response or the response that the ADs were in progress and would be published as soon as they made it through the approval process. The Safety Board notes that the Boeing SBs for 747, 757, and 777 airplanes were issued between June and August 2006. The SB for 767 airplanes still has not been issued because of ongoing “minor” disagreements between the FAA and Boeing; however, in August 2007, Boeing informed investigators that it was making requested changes to the 767 SB and would resubmit it to the FAA in October 2007. The Safety Board is very concerned that the ADs originally scheduled to be issued as early as September 2004 still have not been issued. The Board considers any kind of fire and/or smoke in the cockpit to be a serious issue that could affect other aircraft systems, lead to a loss of visibility, provide a distraction, or incapacitate the crew and possibly lead to an accident. The National Transportation Safety Board recommended that the Federal Aviation Administration: Complete the process begun in 2004 to approve the service bulletin for the installation of the redesigned windshield heat terminal block on Boeing 767 airplanes (A-07-49). Issue airworthiness directives to replace the windshield heat terminal block on all Boeing 747, 757, 767, and 777 airplanes in accordance with the Boeing service bulletins (A-07-50).